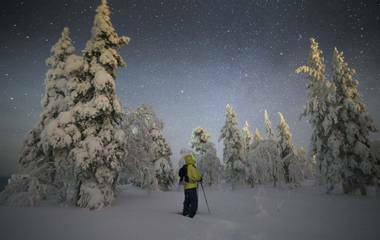 Winter explorers of every age will fall in love with Finland’s spotless outdoors. Much less hilly than its Nordic neighbours, it is a country full of gently rolling spaces and bodies of frozen water. The so-called ‘Land of a Thousand Lakes’ actually has around 188,000 of them, turning the terrain into a shining mosaic. There are also enough forests in Finland to fill an area the size of Italy or the United Kingdom! All our family holidays take you to Finnish Lapland, traditionally inhabited by the indigenous Sámi people and proud home of the ‘real’ Santa Claus. To the South is the quiet town of Ranua and its Wildlife Park. Kuusamo is close by and has splendid fells, perfect to investigate on sleds; further above are Luosto, with its homely log cabins. Near the Norwegian border are a cluster of destinations right in the middle of Northern Lights territory: Jeris or Harriniva – all wonderful locations for a family holiday in Finland. Deep in the wilds is Menesjärvi and its long-established community of reindeer herders; tucked away beyond this is the village of Nellim, on the banks of the icy Lake Inari and close to the Russian border. Want an experience filled and active family holiday in enchanting landscapes full of native culture? Come with us to Finland! The most common way to get around Finland’s whiteness is by snowmobile, which makes for some really zippy excursions. Travel over a 30km route near Nellim with a knowledgeable guide and take in the wilderness around you. At Jeris, you can do the same and stop part way at a frozen lake for an introduction to the Nordic practice of ice fishing. Test your skill and patience to catch a tasty treat! Skiers will love the pistes of Luosto – many locations also offer families the opportunity to try out cross-country skiing routes. For a slower alternative, head on a snowshoe trek and learn all about the plants and animals you encounter. On the subject of animals, children and parents will enjoy Ranua Wildlife Park, which has some 50 species of Arctic fauna. Meeting the resident polar bears is definitely a highlight! 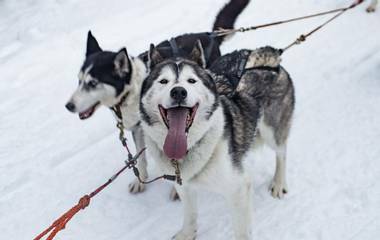 Other animal encounters come with dogsledding, perhaps our most popular activity with friendly huskies carrying you into the distance. 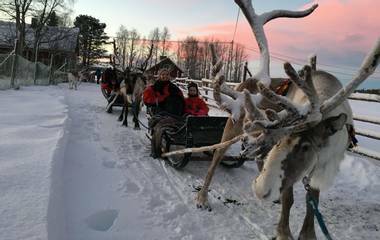 Reindeer sleigh rides bring a magical feel at any time. 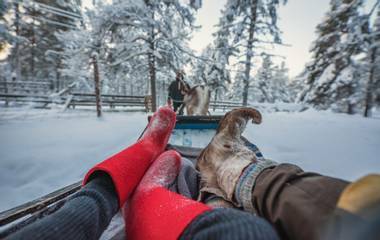 For more local fun, try out Sámi craft-making and create a traditional souvenir to remind you of your holiday, or whip up yummy goods in a Finnish baking session! During the festive season, you can help Father Christmas make gingerbread and go sledging with his jolly elves. 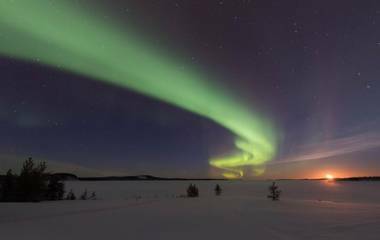 Of course, any winter stay in Finland would be incomplete without night-time Northern Lights spotting, which you can attempt with on-site experts to help you make the most of the occasion. Going round our Activities Abroad team, we’ve picked out a couple of Finnish favourites. While you might expect a husky ride around Finland’s snowy outdoors to be quite a noisy affair, it is actually very quiet and peaceful (once the dogs have hit the trails – they are always very excited beforehand!). One thing is for sure: you and the kids won’t be able to stop talking about it! Children have a great time getting to know their canine friends, and the dogs bound along, filling everyone with a pleasant energy. Ranua Wildlife Park is a real winner with families. There’s a favourite Arctic animal for everyone (we particularly liked the wolverines! ), and the whole place is expertly maintained. Meeting the polar bears sends a real shiver down the spine – not of fear, but sheer amazement at stepping before these grand animals. In terms of food, spiced gingerbread or scrumptious Finnish pastries are perfect after rushing around on the snow – all the better knowing you’ve had a part in preparing them! Gathering round a crackling fire for a meal in a Sámi tent is just as delightful, and very atmospheric. Enough from us – we recommend getting booked up now so you can find your own family favourites. Discover our favourite destinations in Finland.